The Golden Ram Sportsman’s club has generously donated a four-day blacktail deer hunt for auction at the Livermore-Pleasanton MDF Chapter banquet, March 10, 2011. The hunt is for two people and the hunt will take place on the Golden Ram Sportsmen Club’s Bar Z Ranch property near Covelo, which is leased by Golden Ram Sportsmen. This hunt is an unguided, weekday only hunt. Designated camping area is included. Hunter must provide own tent or trailer. Call Golden Ram Sportsmen’s Club to make reservations in advance. For tickets contact Bob Holm, (925)447-2044. A five-day drop-camp trip for two people will be offered at the Livermore Pleasanton Mule Deer Foundation banquet on March 10, 2011. Each person will be provided with a riding horse and pack mule along with a packer to load the animals and guide them to camp. On day one the packer will deliver the riders to their camp site and on day five he will return to pick them up. 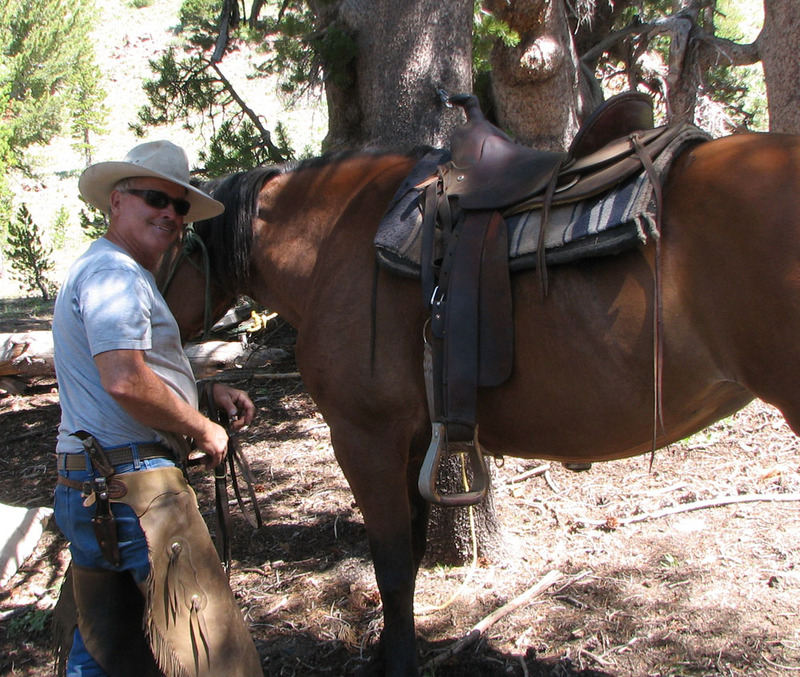 Kennedy Meadows pack station is known for its excellent riding stock and experienced wranglers. A drop-camp can be arranged in the immigrant Wilderness adjacent to Yosemite National Park or in the Carson-Iceberg Wilderness along the Clark Fork of the Stanislaus River. We’ve hunted with Kennedy Meadows several times and had great service. We’ve hunted deer in the Carson Iceberg Wilderness serveral times in the both archery and rifle deer seasons. These packers will get you where you want to go. Here's a nice buck taken in the D6 deer zone. If you’re interested in bear, you’ll probably find one. 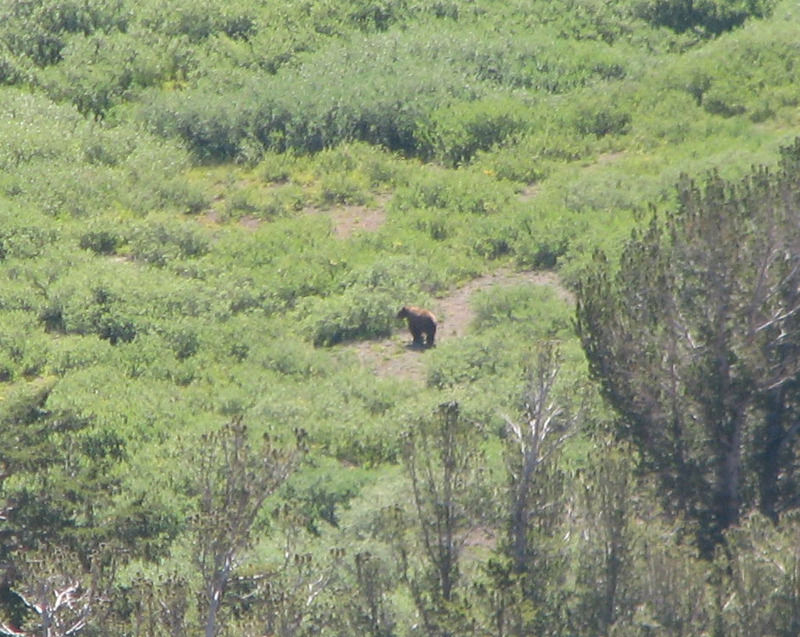 I photographed this bruin during the D6 archery season a few years ago. If fishing is your thing, then Kennedy Meadows pack station can take you to one many lakes with excellent fishing. And, the scenery is impressive. 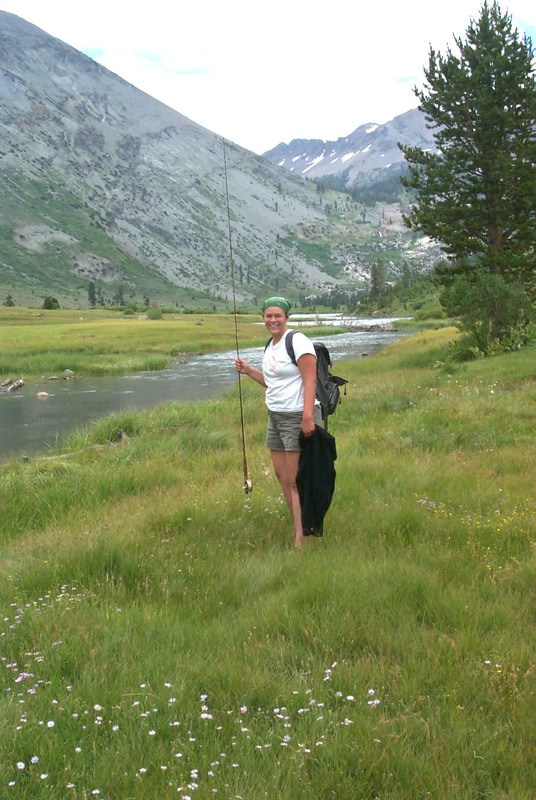 Daughter Betsy and I spent a few days fishing out of Kennedy Meadows a few years ago. The fair market value of this trip is $920. For more information, send me an email. To order tickets, call Bob Holm at (925)447-2044. Rob and I were checking one of our ponds last Monday. As we prepared to leave, Rob stopped to look down at four tracks in the mud. The tracks were large, looking to be a buck, and that’s what caught his eye. Because of the large track size, my guess would be that it was a buck that made the track. However, the actual size of the deer’s hoof can be distorted by mud. The soft medium allows more of the bottom of the hoof to make contact, enlarging the print. We stood staring at the tracks and I couldn’t resist taking a photo. This set of tracks had learning potential. These four prints were made by the same deer and show a pattern. Standing over the tracks, we had the advantage of knowing that the deer was heading towards a six-foot wide drainage from the pond. As the deer approached the drainage, it decided to leap over it. On the other side of the drainage was a steep hill – adding to the buck’s need for power. His jump would provide momentum to help him climb the slippery slope in front of him. Try to imagine the buck stopping at the gap and then leaning forward as he shifted his weight to his front feet. As he dipped his front end down it accepted his body weight. Quickly his hind feet leave the ground and pass his front feet. As the rear feet hit the ground, the pattern you see in the photo is complete. The four hooves simultaniously hit the ground for a split second. He’s now coiled to spring forward – his back arched and his hind legs tensed. Quickly loading his hindquarters and uncoiling, his entire body weight shifted onto his hind feet, pressing down deeply in the mud as his front hooves leave the ground and stretch forward. 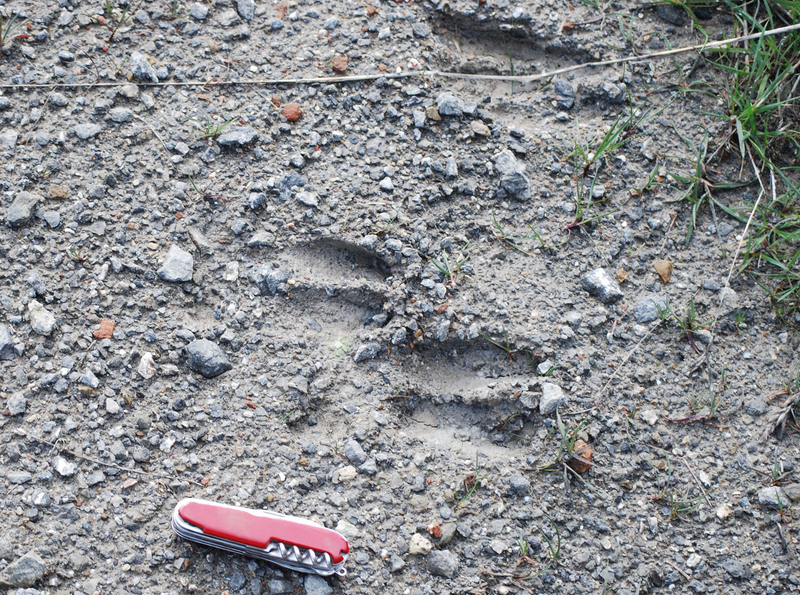 In the track of his rear right hind foot print, you can see where the dew paws made a slight impression (dew paws don’t show in a walking track) – his hooves splayed out as they carried his body weight. We studied the slope where the deer climbed the slope. Heavy rain had eliminated his trail, but the deep impressions left by the initiation of the leap remained. There are also clues here about when the tracks were made. The edges of the track are rounded and at one time they held water. The indication is that the track had been made during the latest rains, but before the end of the rains. By checking the recent weather patterns, one can make a fairly educated guess that the deer had passed by about last Friday, in rain and significantly before the skies cleared on Saturday. Darkness is a fun adventure when you’re in you comfort zone. The more time you spend out at night, the more you can enjoy the medium. And, you can find more critters in the dark. We didn’t find the salamanders, but we found a couple western toads and a few California red-legged frogs. One pair was in amplexus, a scientist’s word for mating. 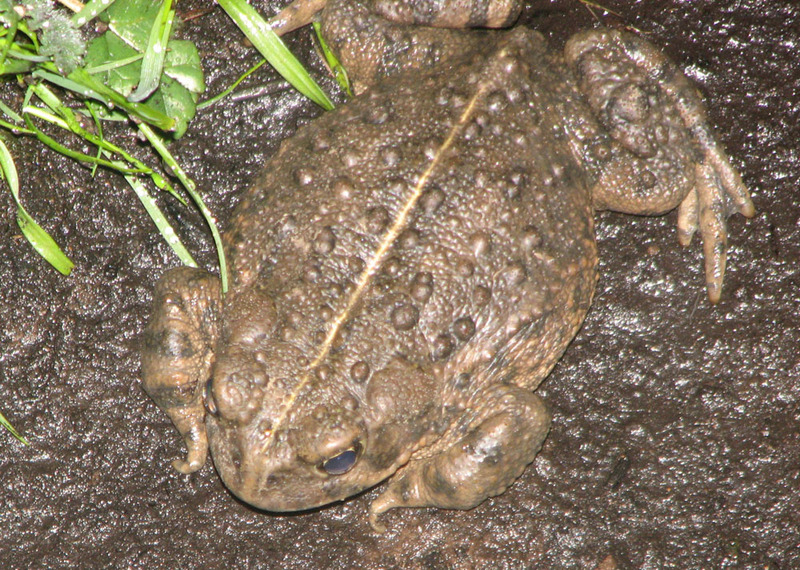 Toads will soon be laying eggs in the nearby ponds. 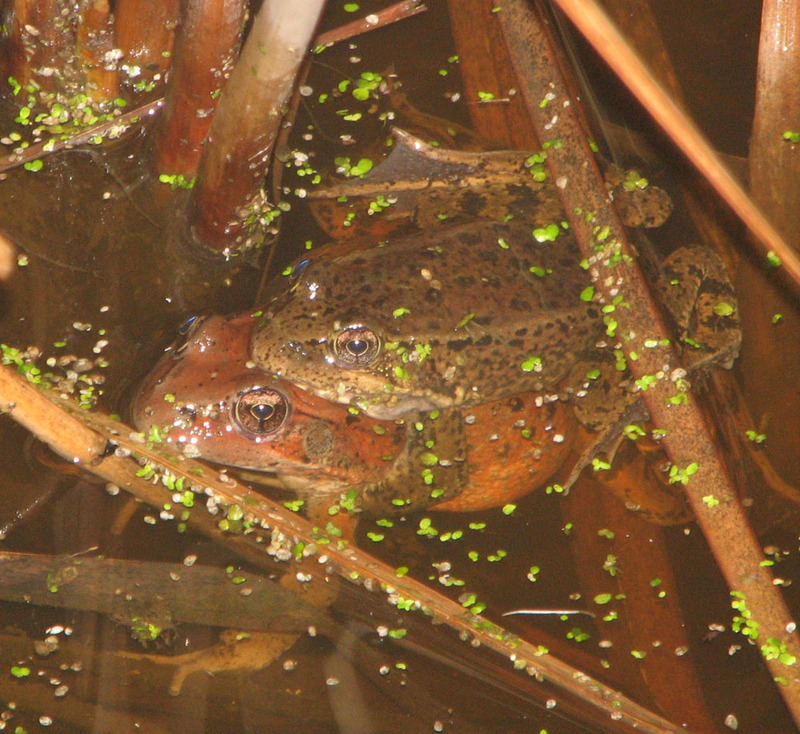 California red-legged frogs in amplexus. 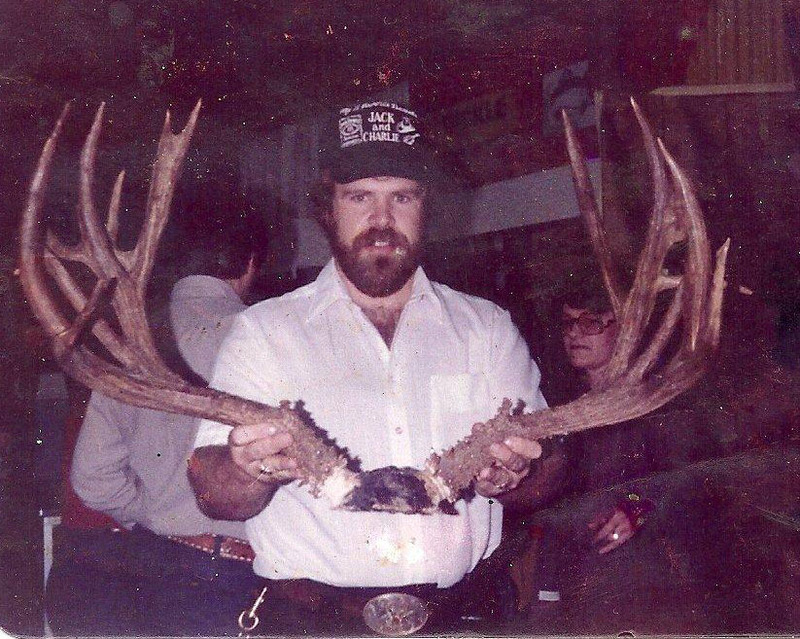 Paul Cardoza holding the Harry Rowell buck's antlers in 1981. In case you missed it, here’s the photo in the previous post. 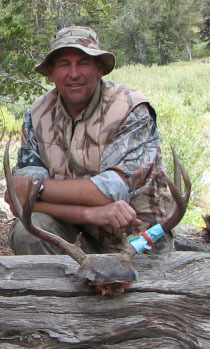 Wonder where those great Nevada antlers went. Last spring I came across a nice buck while turkey hunting. Although his antlers were undeveloped, the size of the base of his antlers indicated that he’d be a shooter. I looked for him during the rifle season last summer and didn’t find him. Rob found him a couple weeks ago. These bucks had several things in common. It’s tough to grow bucks to a ripe old age when the lion density is high. And, that’s what ours is, very high. This buck must have met his demise about the start of the new year. 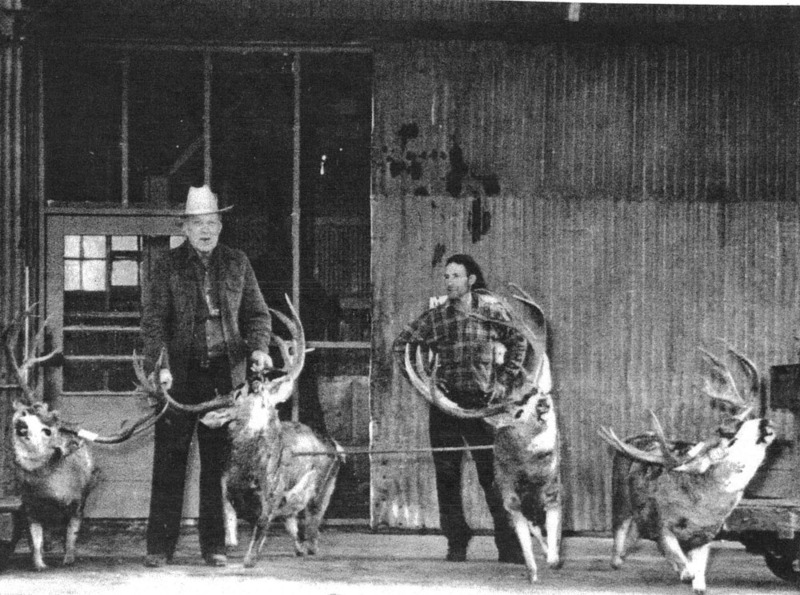 His antlers had many things in common with the other set of antlers in the photo, which belonged to a different lion-killed buck. (See “The Lion and the Buck.”). 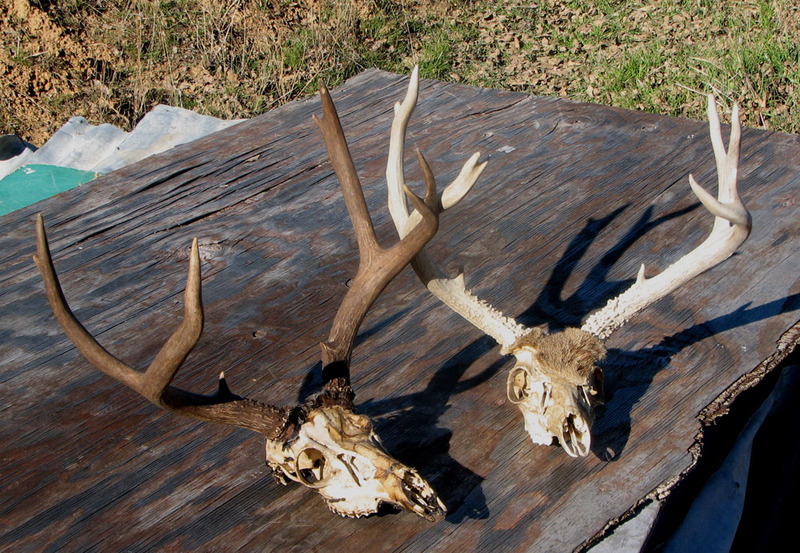 Both are larger than average for mature bucks on our property. Both are not quite at the point of being old – they’re maybe three and a half. Both have four points on at least one side and their dimensions are nearly identical. Both were killed by mountain lions. We would like to grow older bucks, but they just don’t live to a very old age in mountain lion country. Mountain lions are fully protected in California, a status shared by only a few other species. Spent the day at the ranch on Saturday. Sunny day. I kept disturbing flocks of birds, but they were mostly too far away to get a good look at them so I assumed they were horned larks which tend to bunch up along our ranch roads. 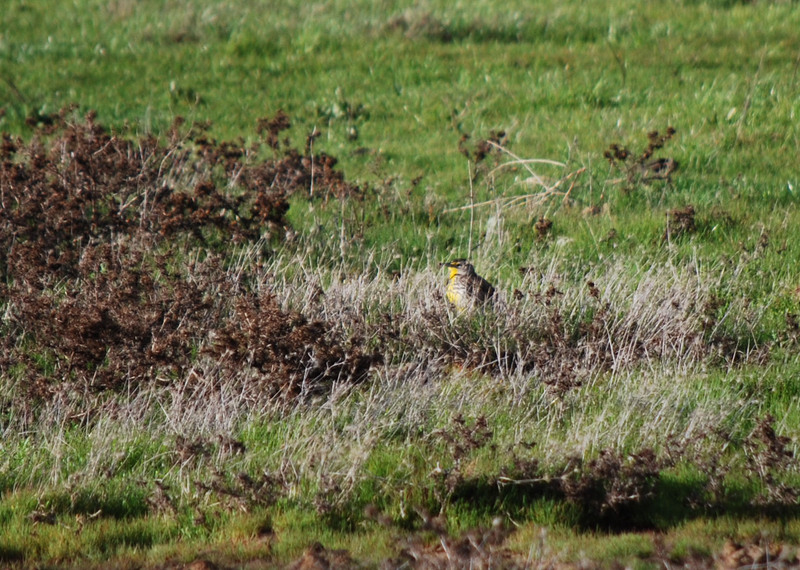 After setting up my spotting scope to look for deer or turkeys, a flock of meadow larks landed about 50 yards away. I realized that the flocks of birds I’d been seeing were all meadow larks. Now meadow larks are not rare, but large numbers of them are unusual these days. 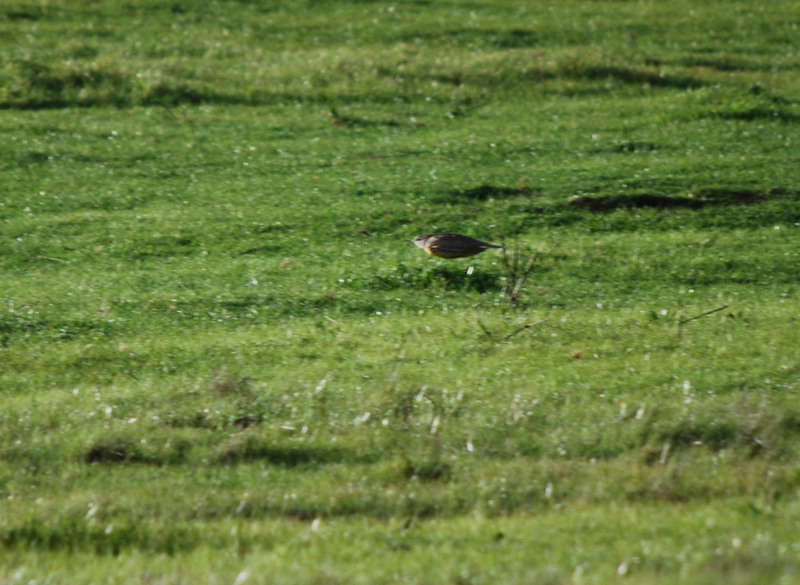 There was a time when meadow larks were about the most common bird in our grasslands. Maybe their populations are rebounding. Today I eyed several while touring around the Altamont. This meadow lark was laying low in the cool wind. When he flew, I made an attempt to catch him in flight. The result wasn’t too bad. Meadow lark in flight. They tend to fly in surges like a swimmer doing the breast stroke - similar to the pattern of a blackbird. It’s nice to see more meadow larks and especially nice to hear them calling.